Home » Is Hitting the Snooze Button Bad for Your Sleep? The National Sleep Foundation recommends adults get 7-9 hours of sleep a night, and it’s likely no surprise that more than one-third of Americans are not getting enough. In today’s ever-growing age of technology, many Americans have swapped their nightstand alarm clocks for smartphone alarms. But one thing that hasn’t changed is the large number of folks who hit (or now swipe) “snooze” more than once each morning, something experts have long maintained is not conducive to quality rest and getting sufficient sleep. As a freelance writer and editor, I’m lucky in that I work from home and set my own work schedule. My husband, on the other hand, has to be at work by 6 a.m. most days. His commute is only 15-20 minutes long, but it usually takes him an hour and half to get out the door because he spends much of the very early morning hours hitting snooze half a dozen times before finally getting up. Predictably, this leaves us both less than rested when it’s time to start our day, but I can often get away with sneaking in a lunch break nap. In the long run, however, this isn’t setting us up for quality rest. According to Michael Breus, Ph.D, a sleep specialist in California (also commonly known as “The Sleep Doctor”), when you hit snooze, you will go back to Stage 1 or 2 sleep cycles, which is when you initially start drifting off and your brain waves begin to slow down. This is messing with your REM sleep, the most restorative stage of sleep and the most important when it comes to feeling mentally focused the next day. When you don’t sleep restfully, it can have lasting effects on your mood, health, family and even your job. This is why hitting snooze can ultimately leave you feeling groggy and zombie-like, and oftentimes less productive at work. While many people view getting enough sleep as a luxury, it’s actually vital for your overall health. Getting sufficient sleep promotes brain health and learning, and helps prevent a variety of health conditions such as heart disease, diabetes, obesity and stroke. Here are a few tips to help you ditch this widely shared habit. While cutting the snooze habit is a step in the right direction, it’s not a cure-all for chronic sleep deprivation (in which you are regularly getting less than six hours of sleep a night). If you’re simply not getting enough, a better habit to adopt is to simply to bed an hour earlier. Even if you get in bed at an earlier hour, if you’ve been staring at a screen until the last possible second, you’ve likely set yourself up for more awake time. This is because the blue light emitted by electronic devices revs up your brain and increases alertness, which would defeat the whole purpose of an earlier bedtime. If you need something to lull you to sleep, try reading a book (in its original form, that is; a Kindle or other electronic book format will likely have the same stay-awake effect as your phone or computer). My husband and I have found a compromise in that he moves to the couch with his first of many early alarms, but this first alarm still often jolts me wide awake while he continues to snooze away. As a last resort for couples like us, Breus recommends getting a vibrating alarm clock for the snoozer (another great option is a sleep tracker). This type of device will stay positioned on his or her pillow, or on the wrist to only wake the snoozer up. You can bet that this is one is definitely going on my Christmas gift list. Consider investing in a coffee maker you can pre-set to brew your morning coffee minutes before you wake up. That inviting scent is sure to coax you out of bed when the alarm does go off. It sounds almost too obvious, but snoozers would likely universally agree that this is easier said than done. And ultimately, at the end of the day (or morning), “it really is best to wake yourself at the last possible moment to get your best rest,” Breus says. 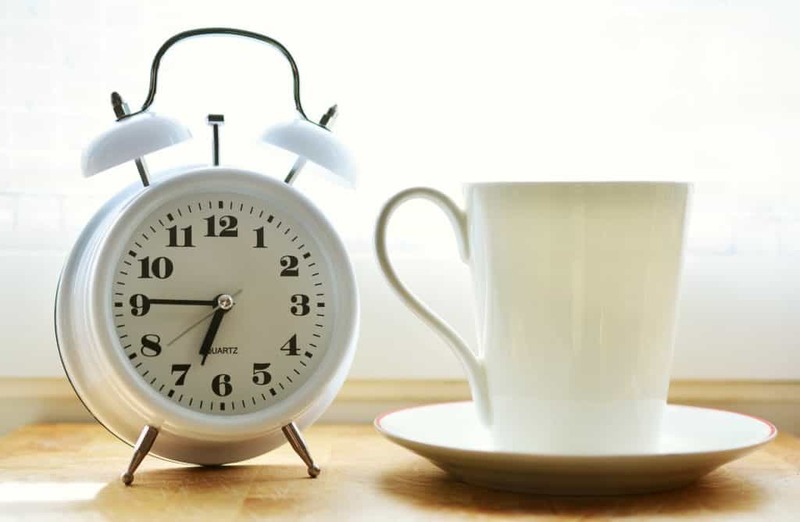 Take it a step further and place your alarm clock on your dresser to ensure you won’t fall back into your old habits and set it more than once. Without the snoozing, you won’t be interrupting your sleep cycles and are actually more likely to get the full 7-9 hours you’ve hopefully set yourself up for. How Long Does It Take to Break the Snooze Habit? No surprise here, but you may find it challenging to adjust to this new habit. But by adopting better sleeping and waking habits and seeing just how much your sleep quality improves, we’re certain you will agree that there is no going back.